A wet day could not rain on the parade of Aussie legend Craig Alexander, who claimed victory in Lizhou one month shy of his 46th birthday. The two-time IRONMAN 70.3 World Champion bided his time in the bunch on the bike, before his steady pace on the run enabled him to push clear of compatriot Sam Betten. Alexander won in 3:48:50 on the back of a 22:27 swim in the Liu River, 2:06 bike in the wet conditions and superb 1:13 run. It was his first win in three years (since IRONMAN 70.3 Busselton), and follows his outstanding runner-up effort at IRONMAN 70.3 Davao in the Philippines last month. Russian Ivan Kalashnikov withstood the challenges on the run for second ahead of German Paul Schuster, who passed a tiring Betten in the final 3kms. 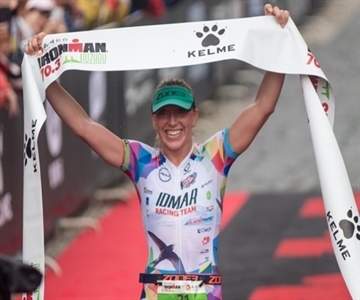 On the women's side, American Kelsey Withrow set the pace in the swim, and was joined early on the bike by defending champion Agnieszka Jerzyk (POL) who broke clear after the halfway mark. She took a 2:40 buffer onto the run, and by the 10km mark had built a 6:25 advantage. Jerzyk claimed back-to-back victories in Liuzhou in 4:15:31, finishing 8:49 ahead of Withrow. Australian Laura Dennis finished 5:26 behind Withrow for third.